After weeks and months of delicate and exact planning of your wedding and reception up to the last minute detail, there is one thing about weddings that will be kept as a surprise until it's over: the wedding gifts ! Now it's all done. You're officially married and everybody goes home happy and full from your reception. You're now left hopefully with a table overflowing with gifts from all your friends and families. You've probably anticipated that you need help to transport all these gifts which should be included in your planning. Open one or two for photography sake during the reception but leave the rest for opening when both bride and groom are well rested. It's a joy to open wedding gifts. I bet you've never received so many gifts at one time in your life. That's because now, there are two of you and with all your friends and families wishing you a new life together, chances are that will be giving you a gift which you can use for your home. When we moved in to our newly rented house, we didn't have much stuff. Okey, we had lots of stuff of our own but no important home stuff like kitchen and dining room essentials. It was when we knew we needed to eat in a few hours and needed a microwave oven to preheat some left-over food from our reception that we looked at all the gifts and chose the gift that was shaped like a microwave oven. And true enough, we teared the gift wrapper to unveil a brand new microwave oven. Yes ! We can eat ! Next up were plates, glasses and silverware so we wouldn't be eating on a paper plate with plastic forks and spoons and drink off a styrofoam cup. We chose the heavy gifts that looked similar to a plate's dimensions. Jackpot ! We got plates and even some cute and durable Japanese serving dishes which we now use for all our viands even if it was meant for sushi. Chances are you'll get most of the appliances you'll be needing: plates, glasses, pitchers, airpots, toasters, ovens, rice cookers and the like. Trust me when I say that this is a lifesaver when you're starting from scratch. No need to dash to the nearest department store to scurry for items you need immediately. If you're lucky, you'll get one of each. And in some cases, you may end up getting different brands of the same item. Receiving plates, glasses and utensils are okey cause it can be put into good use. We got 2 rice cookers. But that's okey. We can save the other as a spare or when we need to cook more rice for a special occasion. We got 5 flat irons of different brands. I don't think we'll be needing all five at the same time especially when we don't have an ironing board yet. One is enough and we'll store the others for safekeeping. Now with all your gifts unwrapped, make sure you note who gave what. The greeting cards that usually come with the gifts and a personal note signed by the giver is a great way of tracking what that person gave. Write the item down on the card or tag and in the case of multiple gifts of the same item (like the iron example above), make sure to include the brand and model of the item so you know who gave the iron you're using. It would be embarrassing to bump into one of your friends and tell them that you love the black & decker iron they gave and it's very handy, when they know they gave you a Hanabishi iron. So keeping track of who gave what is a big saver. And when you have your house arranged and you've settled in comfortably, try to remember who gave which appliances and utensils you're using. When we had our house blessing, we were happy to tell one of our guests that we loved their gift and actually showed it to them displayed in our kitchen. The thought goes a long way and instantly shows your gratitude to the person who gave you the gift. The best way to show appreciation for a gift is a gift that's being used. Happy gift opening newlyweds ! We've been surviving on leftovers and canned goods the past two weeks and I knew that the day I had to cook for real would come this week. The only thing I know how to cook is spaghetti so I did some research online about how to cook adobo. 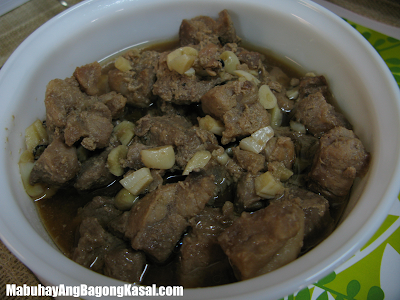 I kicked things off by watching Komikero's video on how to cook adobo. 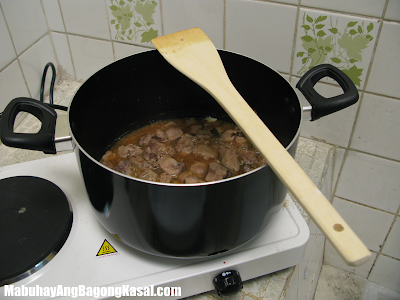 For measurements I followed the adobo recipe on Nora Daza's book. I marinated the meat overnight. Dumped the marinate in the pot and left it to simmer. I only mixed it when it started boiling. My Dad said that vinegar turns bitter when it's mixed prematurely (that got me scared). Also added some sugar. And here's the finished product. My very first adobo! We purchased our washing machine and refrigerator a week before the wedding since we were scared that delivery might take more than a week because of the holidays. Both appliances were delivered a day after the scheduled date because Abenson said that the truck had to be repaired. Installed the washing machine with the help of Mom's all around helper Rommel. We also had him make a stand for us so that the bottom of the machine won't get wet when the water goes out. It took us more than a week to get to our laundry because we were out most of the time due to family activities and the holidays (yup we haven't had our honeymoon yet). Got up early this morning and set my sight on the huge mountain of laundry that had gathered outside of the bathroom. After a hearty breakfast I set the motion of setting up the washing machine by connecting the hose to the faucet and Sweetie did the honors of plugging in the appliance. My Mom and Aunt arrived and supervised a bit when I put in the detergent, Del and some clothes. Filled up the tub with about a third of clothes - 2 pairs of jeans, a couple of shirts, house clothes and a bag of underwear. Choose the fuzzy program (washing machine AI) and ceremoniously pressed on the start button. Watched the water come in a bit and then went back inside, Sweetie went upstairs because the phone was ringing. And then I heard a loud noise coming from the washing machine. It was going wild! It looked like it wanted to jump out of the stand, roll over and die. The noise and vibration was so loud I shouted out to Sweetie to come down and check out what was happening. He held on to the washing machine so it wouldn't shake so bad while I contacted Samsung's customer support. Samsung's customer support passed me on to their technical support and they asked just two questions: (1) whether the washing machine was on even ground; and (2) about the load. I told him that the washing machine was on an 8 inch stand which we had customized and that I filled up the tub just about a third-full. Customer service also mentioned that the load may not have been balanced. During that time I heard that the washing machine was spinning again and making loud clanky noises. I ran back downstairs and paused the cycle and looked in to check the load. Since it was already rinsed and almost dry I cancelled the rest of the cycle and turned off the appliance. And then Sweetie and I hung up the clothes. 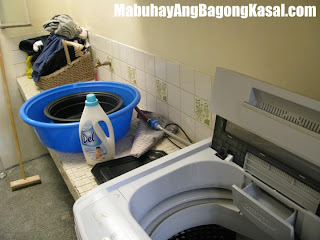 Lesson learned: do not overload your washing machine. 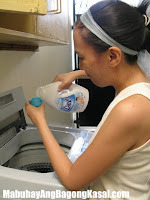 You should consider that the clothes you put in should weigh at the capacity of the machine when wet. I hope when I get enough courage to do the laundry again things will work out fine. I used to bake a lot but I can count with my fingers the number of times I've actually cooked (just spaghetti and bacon). It's not because I don't want to cook, I'm just insanely scared of fire/flames, oil wisik and I've developed an allergy to LPG. We received an electric stove as one of our wedding gifts so we were quite excited to try it out. We planned to cook sinangag and hotdog for breakfast. Up early the day after we went to the grocery I prepared the rice, garlic, egg and sliced some cold cuts for the sinangag. Cleaned up the pan and readied the cooking oil while Sweetie was preparing the electric stove. It was both our first time so we opened up the manual, but it was practically useless since it didn't even show which of the scribbles on the knob meant "off". Went ahead and turn on the electric stove, placed the pan on one of the pads and placed in some cooking oil. Waited for the oil to heat up a bit when suddenly the electric stove churned out some white smoke from its bottom. Tried to check the manual again but it didn't say anything about it so Sweetie immediately unplugged it and brought it out to the dirty kitchen since it was quite smelly. We ended up placing all the ingredients in a bowl and cooked it via the microwave. 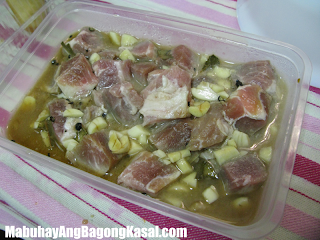 The sinangag didn't turn out the way I envisioned it, but it was still edible. Sweetie also cooked the hotdog through the microwave. We later on had the stove checked by my Mom's trusty all-around worker and he was smiling when he told us that what happened was normal since the stove was new. He said that the coils were heating up for the first time and that's the reason why there was smoke (and one of our Plurk friends confirmed this). Our first cooking attempt was a huge failure, but we still had a hearty breakfast. Don't know yet when we'll cook again... we're planning to collect some food from all the parties we'll be going to in the next few days. This is definitely going to be a memorable year for the two of us since we are starting a new chapter of our lives and our love. Cheers to new beginnings and happy endings!